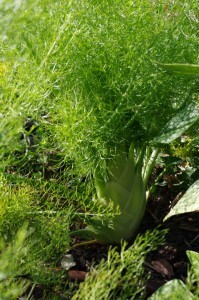 This is my first year growing Florence Fennel (the bulbing kind). Fennel grows wild around here so I figured it would do well in our yard. Boy has it! This will definitely be something we’ll continue to grow. In addition to the fennel we harvest some of our first potatoes from our potato bins! They are nice man-fist-sized new potatoes that Tom just reached into the soil and grabbed. Definitely the best looking taters we’ve ever harvested. I’m looking forward to see what our potato harvest comes to this year. 1. Preheat oven to 375 deg F.
2. 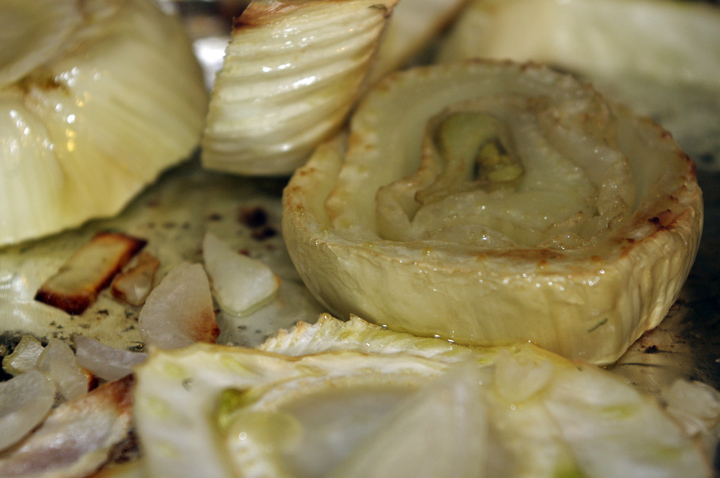 Cut fennel bulbs in 1/2″ slices. Put fennel and chopped onion on a cookie sheet. Drizzle with olive oil and sprinkle with salt. Roast for 25 minutes or until tender and slightly browned. 3. Divide the bacon in half. Leave one half in slices and cut other half in 1/4″ chunks. In a dutch oven cook slices until crispy. Remove slices from heat and put on paper towel to cool. Cook bacon bits in a fry pan until crispy. Put slices on paper towel to cool. 4. In dutch oven with bacon grease from slices add cumin and caraway seeds. Cook until fragrant – about a minute. 5. Add chicken broth, potatoes, fennel and onions to dutch oven. 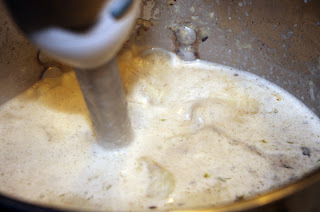 Bring to a boil and reduce to a simmer. Cook on medium high until potatoes are tender. 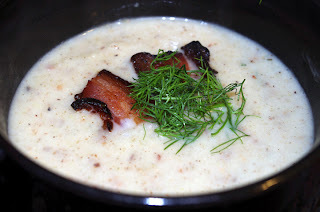 Add bacon chunks, milk and half and half and use an immersion blender or food processor to make soup smooth. 6. Serve with a garnish of bacon slices and fennel leaves. YUM! That looks REALLY delicious! !